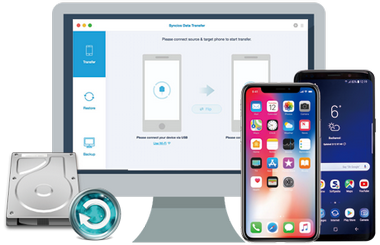 Syncios Data Transfer for Mac is the best phone to phone transfer tool lets you quickly copy data between iPhone and Android phones for Mac users – all in just one-click! 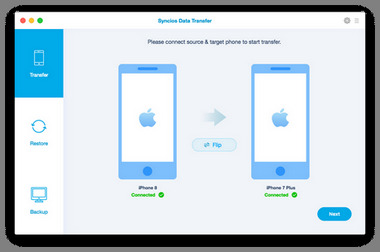 Phone to phone transfer tool for Android & iOS on Mac. Transfer various data like contacts, messages, call history, photos, music, videos and apps. Backup your phone (iOS, Android) to Mac and transfer saved backup files to new phone. 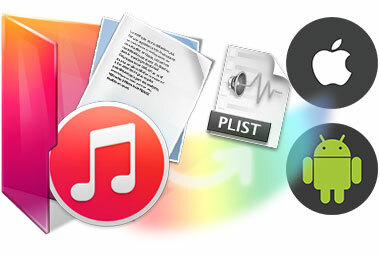 Extract iTunes Music and Playlists for iDevice/Android Phone. Fully compatible with iOS 12 and the latest Android devices. It’s a very simple phone transfer tool. I like the way it makes it easy to perform tasks that are difficult to do in itunes. Only need one click to transfer photos and music from one phone to another on my mac and with no extra help of other tools. Great! Switching to a new Phone but concerning about data loss? Have question about how to sync or transfer files easily from your Android phones to your PC or Mac computers? Do not worry, with Mac Syncios Data Transfer, the data that you cannot afford to lose will land to your new phone safe and sound. Just one click for all mac users. Transfer almost all files, including contacts, video, SMS, photos, call logs, WhatsApp, music, Ebook and apps between phone to phone! Backup your Phone to Mac and Restore. Sync collected songs & playlists from your iTunes backup. Moreover, you can also transfer iTunes backup contacts, SMS, videos, photos to your other new Android or iOS device with ease!